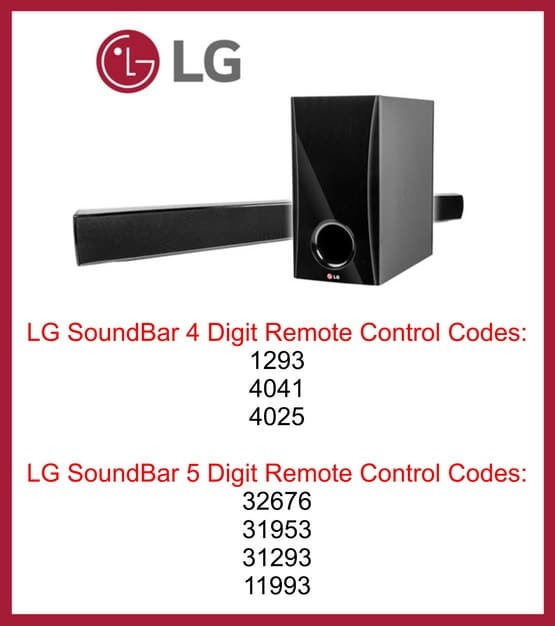 Looking for an LG soundbar remote code? If you have an LG Sound Bar and want to control it with a Universal remote control, Cable remote, or SAT remote, we have the codes needed. An LG soundbar can be controlled with just about any universal remote control if you have the correct programming guide and the correct remote codes for the sound bar. If the codes below do not work with your LG sound bar, please leave a comment below with the complete model number of your remote control and model number of your LG soundbar and we will find you the correct remote code. Program your universal remote control to an LG Sound Bar. Use the following 4 and 5 digit remote codes. NOTE: Some soundbars can be programmed to accept other IR commands to control them. Apply the TV volume IR into the LG Soundbar. OR… Use AUX mode on your CABLE/SAT remote to control the sound bar as the newer remotes will accept the codes under the AUX mode. Use the 993 code to make the AUX Volume mode control the LG sound bar. Unlock the volume with the 993 code and the Comcast remote will then control the volume via the soundbar and not the TV. All codes reported working with LG Soundbar models: NB2022A, NB4530, LSB316 Soundbar, NB3510A, NB3532A, NB3520A, NB3530A, NB2540, NBN36 280 watt, LG 300W, LAS454B, LSB 316 Sound Bar with wireless Subwoofer, etc. These remote codes have been tested with the following remote controls: Comcast remotes, Xfinity X1 remote, Xfinity XR2 remote, Xfinity XR5 remote, DirecTV RC7X, DirecTV RC73 remote, Time Warner Cable UR5U-878OL, Direct TV remote RC65RX, U-verse remote, U-verse remote S10-S4, AT&T remote, etc. The silver remote with the RED OK button will work with the remote codes above – The gray remote with the RED OK button is considered legacy equipment, therefore there are no new remotes with updated codes. USING DIRECTV AND REMOTE CODES DO NOT WORK? 1 – Use AV1 or AV2. 2 – Press and keep holding MUTE and SELECT. 3 – It will blink 2 times then release. 4 – Enter 9 9 1 on the remote. 5 – Enter 3 on your remote. 6 – Press and then release SELECT or VOL UP (test to see which exact button on your remote works). 7 – Point your remote control at the soundbar and keep pressing and releasing CHANNEL UP. 8 – Once the volume changes you need to press SELECT to lock in the code. Need more help programming your Universal or CAB SAT remote to your LG soundbar? Please leave your questions below and we will be happy to assist. I have lg soundbar NB3530A and remote UR5U-8780L. I tried all the above codes but none worked. I hava an LG LAB550H sound bar and just installed Dish tv with a Hopper 3 and have used the above 4 digit codes and they dont work. I have also tried using the dish remote and have used the auxilliary device pairing wizard and tried all 7 of their codes and the volume up or down works but it wont turn it on or off. Please help, extremly frustated. Unable to find the right code for my LG NB2020a soundbar to program my sky remote. Spectrum Cable can’t help me program my LG Sound bar Model # NB3532A with Spectrum remote URSU-8780L can you help? Check our post about How to Program your Spectrum or Time Warner Universal remote UR5U-8780L. Have a ‘One For All’ URC-7140 remote control and need a code for LG sound bar model number NB2020A please. I cannot find a code to connect my LG Soundbar/subwoofer model NB3530A to my service electric cable universal remote PHAZR-5 model UR5U-9000L/UR5U-9020L. It will only accept 3-digit codes and 993 did not work. I need the remote to control the soundbar volume. I had it working on a rc65rf remote and need it on this new remote. LG Sound bar nb3532a and brighthouse remote ur5u-8780l-bhc. codes not working. tried every method. Need a remote code for UR5U-8780-TWM (spectrum universal remote). LG sound bar and wireless subwoofer NB3530A. I need a code for my LG 300 W soundbar to work with my Spectrum universal remote. Need to program my Spectrum remote model: UR5U-8780L-BHC to my LG soundbar model: NB3530A. Can you please let me know the universal code of LG musicflow HS6? Looking for a LG sound bar code for my spectrum report control (UR5U-8780L-TWC). I cannot connect my universal remote to my soundbar model number NB2022A. Nor can I connect with bluetooth. Have NB3530A LG soundbar and Time Warner UR5U-8780L-TWM remote. Tried 993 code, tried 11993 code. Neither worked for me. Looking for the LG Soundbar N3530A program code on a CLIKR 5 UR5U-8790L-TWO remote. I have a nb2338a LG sound bar and a ONB13AV004 universal remote. Can you please send me the correct code. Looking for code for LG-SH3K for U verse s10-s4 remote. I have a ur5u 8780l twm looking for 3 digit code as well for LG sound bar. LG LAS160B soundbar. Do you have working codes work for u verse? I would like to control my LG sh5 soundbar volume with Sharp aquos tv remote control. Can you please advise how can I do this? i need the remote control codes for a LS450 2.1 ch 220 watt soundbar. i am using an All For One a/v Producer 8 Universal Remote. I have a TWC UR5U-8790L-TWC that is looking for a 3 digit code. I had it working before, but now it won’t work. I have a Directv RC72 remote and need to program it to control LG SH4 soundbar. Is there a code for this? 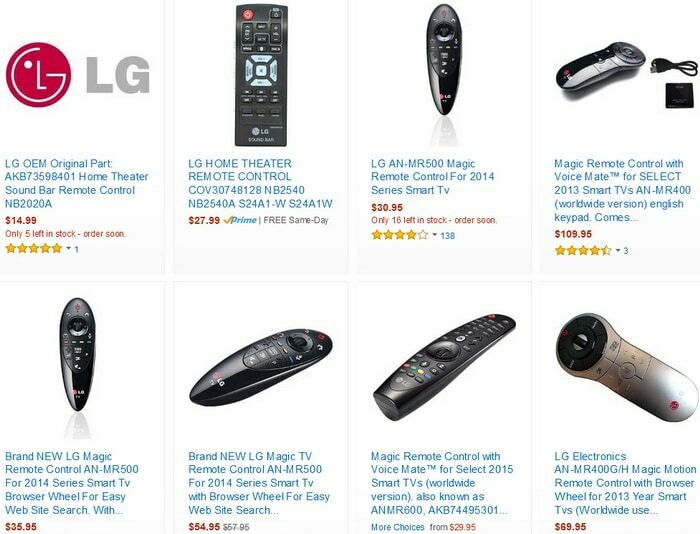 Using Direct TV remote RC65, trying to control LG sound bar NB4530B. Nothing works. Have tried repeatedly all suggested and printed codes as well.